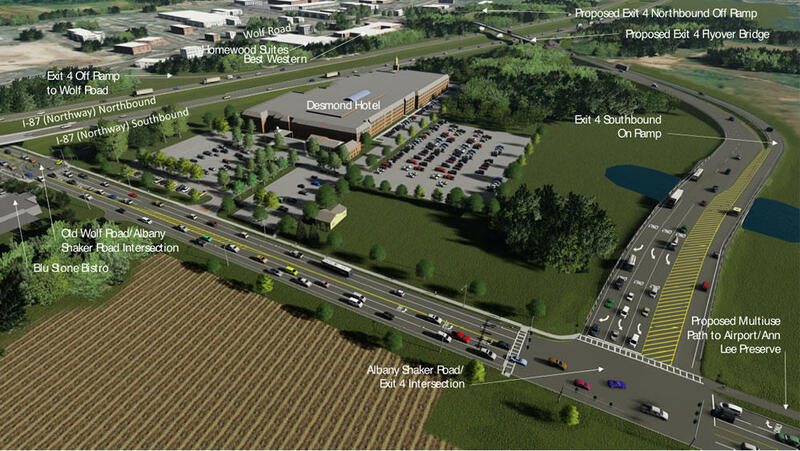 The Albany International Airport is set to get terminal upgrades and a new parking garage as part of a $42 million renovation -- and there's now a set plan for a new "airport connector" roadway at Exit 4 off the Northway. New Parking Garage -- The project will construct a 1,000-unit, multi-level parking garage, expanding airport parking capacity by 20 percent. The pre-cast concrete garage will provide a heated pedestrian walkway to the airport terminal. Energy-efficient LED lights will illuminate that bridge, enhancing visibility as well as vehicular and pedestrian safety. Parking Access Improvements -- The project will install new LED electronic signage, car counting devices, and interactive access control devices that utilize advanced GPS technology to locate available parking spaces and provide wayfinding messages that direct motorists to them. The existing parking system is nearly 20 years old and its electronic controls are in disrepair. 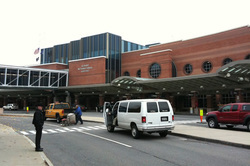 Terminal Rehabilitation and Passenger Amenities - The project will rehabilitate the terminal, including escalators, restrooms, waiting rooms and the food court. Improvements will include new carpets, wall finishes, tile floors, energy-efficient lighting fixtures and better Internet connectivity. If you've been worried that no one has been addressing the Capital Region's critical lack of selfie infrastructure, worry no longer. 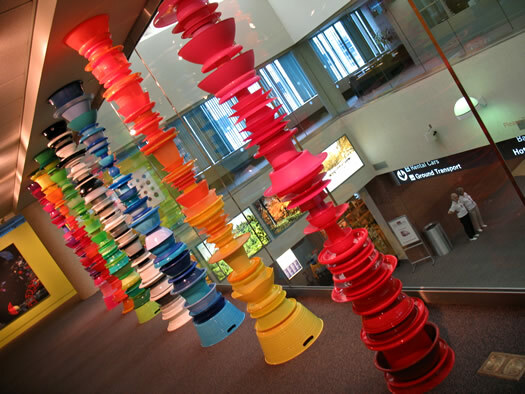 After you participated in the ongoing everyday art direction of modern life, be sure to check out the actual art in ALB's gallery (probably our favorite thing about the airport). The current exhibition, Lit, includes works that make use of light in interesting ways. 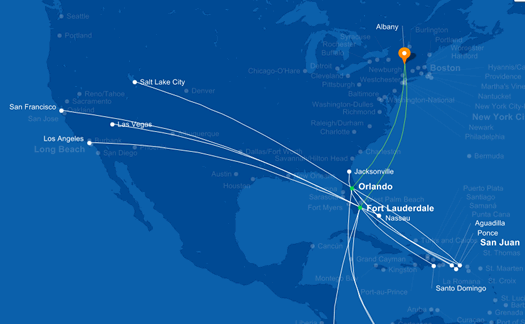 JetBlue's service map for ALB, clipped from its website this afternoon. 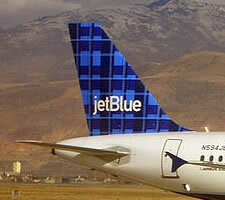 Announced today: JetBlue will start service out of Albany International Airport on December 10. 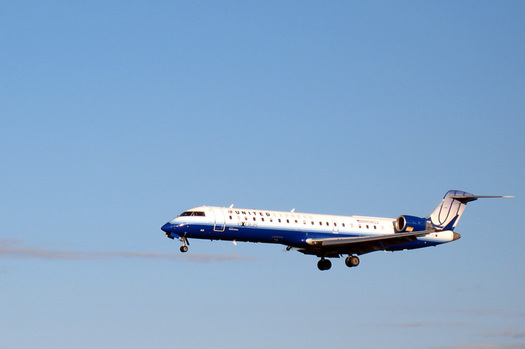 The airline will be flying direct routes from ALB to Orlando (MCO) and Fort Lauderdale (FLL). From there it's possible to transfer for a handful of destinations out west and the Caribbean and South America. When word first got around last year that JetBlue would eventually be flying out of ALB, officials -- specifically Chuck Schumer -- said increased competition from the service would help keep fares down here in Albany. And the Senator reiterated that idea today. Also: JetBlue is offering a one-day-only $16.86 one-way fare deal for Albany on Monday -- we didn't include that. 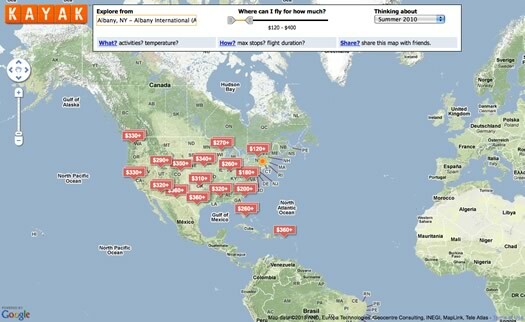 Update: For some context, we pulled federal airfare data for flights between Albany and a handful of Florida markets -- let's have a look. 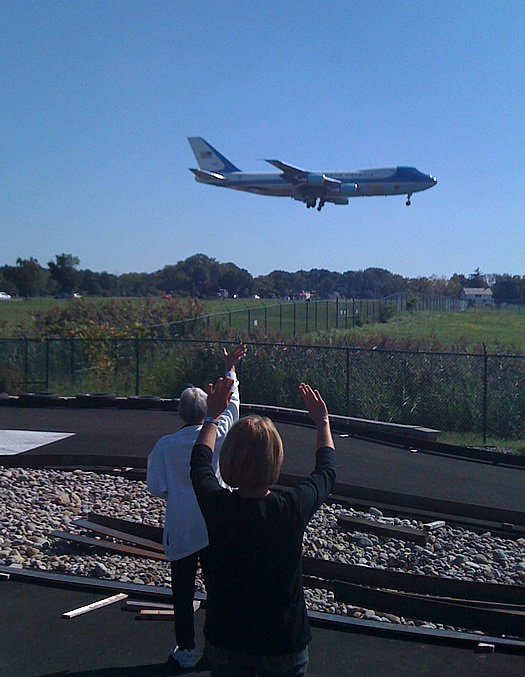 The gray, rainy weather made it hard to spot Air Force One as it approached ALB today. But YouTube user MusicalDarkHorse caught video of it just before it landed. Yep, it's a large airplane. There's another AF1 clip after the jump. Perhaps not ROFLMAO, but definitely smile inducing. No, the Joe Bruno bust isn't at Albany International right now. But there's other stuff to see -- and funnier. If you're heading out of town, or delivering/picking someone up to/from ALB over the holidays, take a few minutes to stop up at the 3rd floor gallery to check out the LOL exhibit. You might even want to just take a trip out to see it -- even if you're not going anywhere -- just for giggles. Last week Bob over at Planet Albany noticed that the Joe Bruno bust that has watched over the observation area at the Albany International Airport was no longer on display. Considering all the drama (if that's the word) surrounding Bruno over the last few years, the absence of the bust honoring him might make you wonder why it was missing. She was in the top 10 percent in Albany at catching weapons on the X-ray machine. She passed her skills test on the first try. She caught a woman on her way to Vietnam with $30,000 in cash. And she didn't mind working with the passengers -- her training as a massage therapist kept her from being squeamish, as some officers were, about patting down elderly and special-needs passengers. The assistant director told her he was investigating a threat of workplace violence. He said that her former mentor in on-the-job training, officer Mary Bagnoli, reported that she was afraid of Smith because she was a witch who practiced witchcraft. She accused Smith of following her on the highway one snowy evening after work and casting a spell on the heater of her car, causing it not to work. Well, actually, Bagnoli said she hadn't seen Smith's car, but she had seen Smith. "I thought to myself," Smith recalls, "what, did she see me flying on my broom?" The woman says she does practice Wicca (and is reclaiming the word "witch"). As you might expect, there's more to the story -- including whistleblowing about alleged security problems, what sounds like less than-great management, and... uh... two black cats. They have a checkered past. And present. But no future. If you're driving through Latham this week, tip your cap to the checkerboard towers. 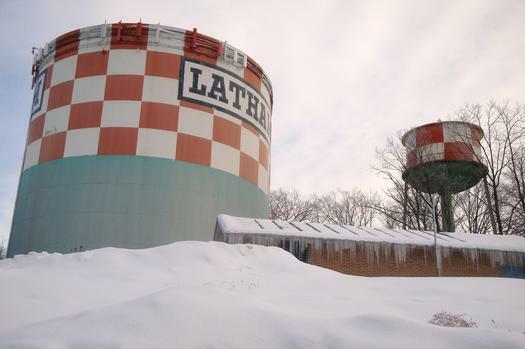 Demolition of Latham's landmark water towers is scheduled to start today. The FAA has said the towers have to be removed because they're on the flight path of a runway at the Albany International Airport. Here's a lot more detail and explanation -- including notes, pics and photo advice. When notified by the cheerful screener that I had been selected for additional screening (the screener's tone reminded my of the announcer who tells the contestant that she has just won a TV on the Price is Right), I stepped reluctantly toward the machine and asked her quietly whether I had the right to refuse the search. I did not want to become a spectacle, or have to rent a car and drive back to Maryland. The screeners face dropped and she appeared stunned, as if my question had been received like a body-blow. She asked me to repeat what I said, and I repeated my inquiry regarding whether or not I had the right to refuse this search, especially since it was my understanding that the equipment did not work. She responded defensively, "It sounds an alarm!" 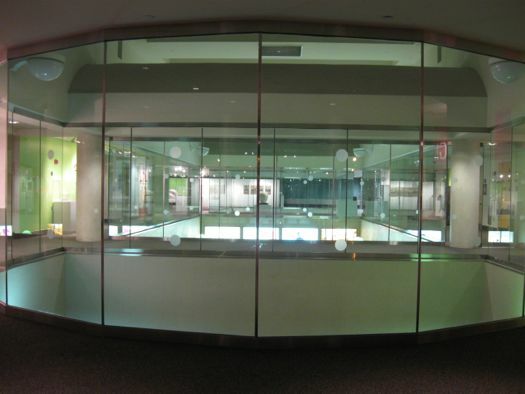 One of our favorites things about the Albany International Airport is the upstairs art gallery. We appreciate the fact that a place that's all about hustle and bustle has a space that's dedicated to pausing and thinking. 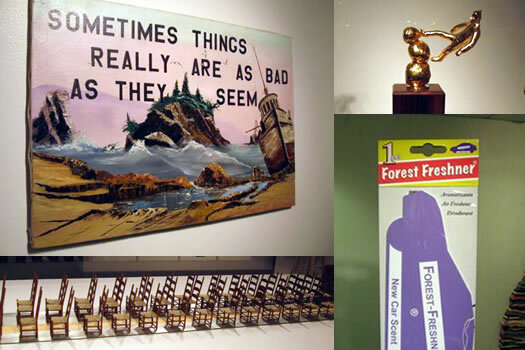 If you have some time during your next swing through ALB, the current exhibit is worth checking out. Up, up and away -- for cheap. 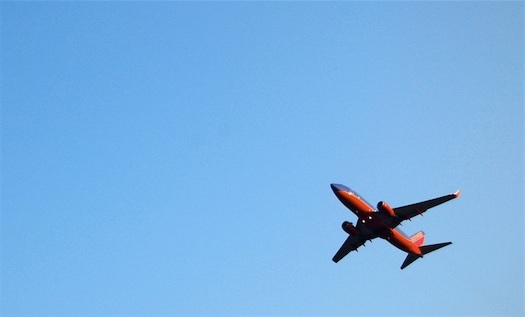 Southwest announced what looks like a pretty good fare special today: every city is on sale for the next 48 hours. One-way fares are $30, $60 or $90. Of course, there are a handful of restrictions. You have to travel between September 9 and November 18. The sale doesn't include Friday and Sunday flights. And you have to pay fees and taxes on top of the fare. We were curious about what kind of deals we could get out of ALB. A list -- with a few comparison prices -- is posted after the jump. The upside: these mittens come already trained. Check out these mittens Flickr user Photos o' Randomness spotted in an exhibit at the Albany International Airport. 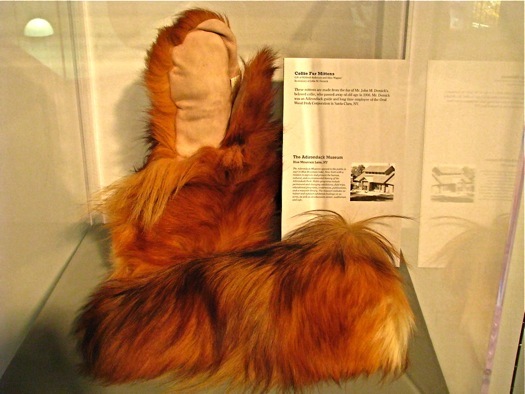 Does the sign in the case say "Collie Fur Mittens?" Yes. Yes, it does. Note: the TU's site, in a stripped-down version, seems to be up again. Sort of.